Originally written for the Blue Ribbon Flies blog in September, 2011. If you’re planning on fishing the Gibbon, there are some useful tips here. Last Wednesday afternoon I went fishing on the Gibbon River. The day was vintage September, bathed in the warmth of Indian summer, rich with blue sky, nary a breath of wind. I chose the Gibbon for two reasons. One, I hadn’t fished it this year. Two, last week marked my thirty-sixth season of fishing Yellowstone Park, and I felt a need to contemplate the passage of so much time. I thought it would be fitting to do so on one of the first rivers that I fished in Yellowstone. So off to the Gibbon it was. Driving up from Madison Junction I saw few anglers, and I stopped alongside a stretch of pretty pocket-water below Gibbon Falls. I strung my rod, pulled on waders and walked over to the water. It looked inviting alright, just as it did all those years ago. I thought briefly about my first trip to the Park, fishing with my brother and a close friend. We were young then—I was still in high school—and we lacked experience, but the Gibbon had graciously provided us a modicum of success. Still strolling memory lane, I began casting to a juicy-looking run that shelved off into a pool of some depth. My fly of choice was a big beetle, given to me by a friend some years prior and as yet unfished. I made eight or ten casts into the teeth of the run, each drift ripe with expectation, but moved nothing. Wading upstream, I suddenly spooked a sizable brown from under a log near my feet. The water was a foot deep. In that moment I snapped back to real-time, remembering a lesson I’d learned over the years about the Gibbon. It is this: Rarely is the best-looking water the most productive. Odd, I know, but that’s how it seems to work here. I think one reason for this is that the Gibbon is essentially brown trout water. 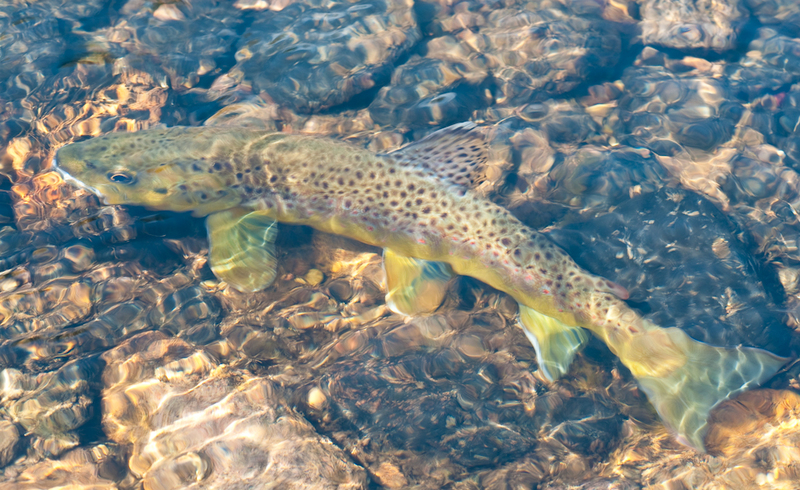 And brown trout by their very nature like to hold in off-beat lies. Not second class lies, simply the less-than-obvious spots that are often overlooked by anglers. Since the Gibbon has plenty of irresistible textbook runs and pools, it’s easy to fall into a routine of fishing only those spots. 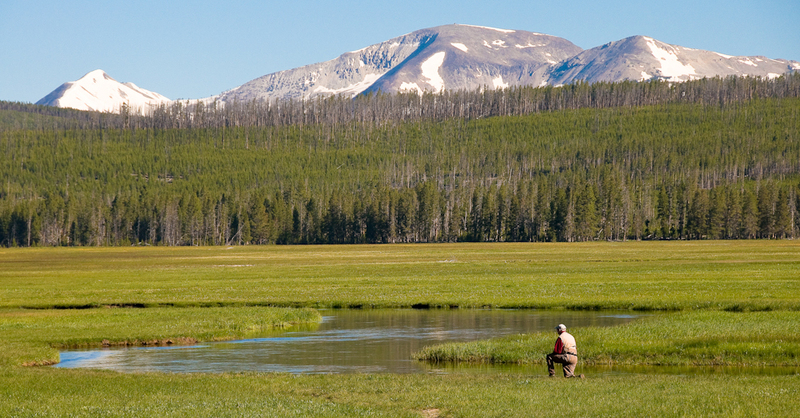 But an attentive angler will also fish the shallow pockets formed by rocks and weedbeds. He’ll fish the grassy banks where the water appears too shallow (it isn’t). All side channels, no matter how tiny, will get a close look. Where fallen trees cushion the current, casts will be made. Next time you find yourself on the Gibbon, you might think about working all the possible lies, if you’re not already doing so. If your experience is anything like mine, you’ll be glad you did.